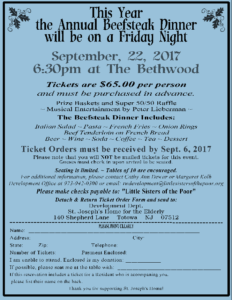 Join us for the Annual Beefsteak Dinner! Friday, September 22 at 6 p.m.
Tickets must be ordered in advance by September 6. For more information, email twdevelopment@littlesistersofthepoor.org or call 973-942-0300 and ask for the Development Department.